If you enjoy a variety of techniques, multi-tasking with projects and exploring new ideas, the DualMate Plus IV has the versatility you’ve been searching for. 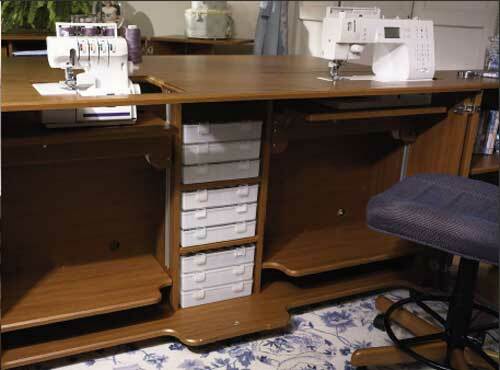 You’ll find a home for your sewing machine, embroidery or quilting machine, and an overlocker – all in one studio! Lower the machines you aren’t using for a larger surface area or instantly take a project from one machine to the other! Add a RollAbout to one or both sides of the DualMate Plus IV for an astonishing 3.6 square metres of workable space. Complete your suite with a StorageCenter that can hold fabric, notions and supplies for any idea that you can dream up. This is the studio and suite for any creative type in search of a flexible and resourceful home.